Wood routers are amazing tools to have in your workshop as a wood worker. The most significant part of the router is the bit which are used for cutting edges. 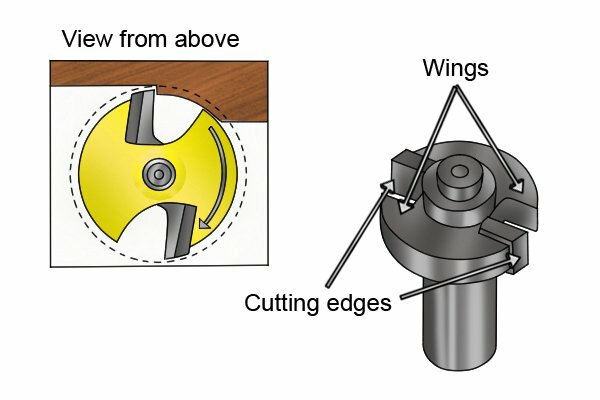 As the bits keep spinning, they will cut through different types of wood without a problem. However, as you keep using your router, the bit keeps wearing out as a result of the friction. In a short while, you may be required to replace your bit so as to continue using your router and make effective cuts. This is the initial stage of the entire process as it will help you examine the bits. You will start by scrutinizing the bits and do a general cleaning. A wire brush and hose pipe will do the job perfectly without a problem. This will help you remove the loose dirt that may be attached on the router bit. You should pay keen attention to the cutting edges by cleaning them properly. If you are in the habit of frequent cleaning, this is all that it takes keep your router bits on top performance. It is actually advisable to clean the bits immediately after the routing task. When you are inspecting the bits, you should also check the condition of bearings. An Allen wrench should help you to remove the bearings so as to be able to clean them as well. There are quite a number of cleaning products that are recommended for this purpose. You should ensure that they are well lubricated before returning them into their place. The next thing that you should pay focus on is the shank that is on every bit. Remove all rust or burrs that may be on the shanks. The shank is very essential as it will influence the grip the collet has on the router bit. Use a Sandpaper to remove most of the dirt and other nicks that may be affecting the performance of the router bits. The last thing that you would need to do during inspection of your bit is checking the carbide cutting edges. In the event that there are huge cracks on the carbide, it would be advisable to replace it. In as much as carbide is quite hard, it seems to break easily. You should carefully examine the carbide so as to prevent any dangers of breaking down when routing. container that has a cleaning solution. If you have been cleaning them often, you could just spray the cleaning solution. Once they are well soaked for a couple of minutes, scrub them using a wire brush so as to remove stubborn stains. You should not use too much force to scrub the scorch marks as they do not really affect the performance of the bit. Just ensure that you have gotten rid of all the loose dirt that may be on your bit, which may affect the carbide and the bearing when routing. With the router bit perfectly clean, you should clean your bearings as well so as to enhance the performance of your wood router. Use a toothbrush and a lubricant to clean the bearings. The lubricant will grease the bearing and make it the movement smooth. In the event that you have cleaned the bearing but it seems not to move freely, you should consider replacing it with a new one. You should be very careful when replacing the bearing as they do not come in a standard size. Get the correct measurements which you will use as reference for replacing the bearing. The last stage of restoring your bits is to hone the edges. There is a diamond stone that can be used for this purpose. Do not be deceived to think that you can sharpen carbide with any other type of material. When you are honing, you should only work on the flat surface on your bits. You should stay away from the beveled edges as honing them would do more harm than good. If you really want the edges to be worked on, you should get a professional to sharpen them for you. This will ensure that the profile is not affected in any way and your bit can continue working as required. For honing purposes, you would need to clamp the paddle to the workbench that you have and ensure that it is sturdy. Once you have this in place, you should take several strokes on both sides of the router bit. Alternating between the flat and flute surfaces, while taking equal strokes will generate exceptional results. It is advisable to inspect the bit as honing continues, this will help you determine when you are done. You can lightly touch the bit with your hand so as to establish if it has become sharp. A good indicator is when you can see a shiny edge on your bits. At the very beginning, this may appear to be a challenging task. However, when you get the hung of it, you will enjoy doing it. Make it a habit to clean, lubricate and hone the bits so as you can make accurate and top notch cuts using your wood router. Once the bits are completely worn out, you should replace them, but in the meantime, follow the instructions and tips above and you can elongate the life of your bits. We also have some tips are “How to Setup and Use Router Table System ?” and ” Must-Have Router Table Accessories for Quality Results ” some days ago . You can follow that links to find more information which can help you something or comeback our home page to explore all catalogues we have .